View Hopkins River Basin in a larger map (opens in new window). 2 ha. 37 ML. Family Fishing Lake, picnic tables, no toilets. A small ornamental lake located in the Alexandra gardens controlled by Ararat City Council. No boating is allowed. Contains tench, goldfish, short-finned eel and redfin to 300 g. Managed as a Family Fishing Lake and stocked with advanced yearling rainbow trout (See Introduction). 4 ha. 172 ML. Also called Goldfields Lake. Surrounded by scrub with deep water at one end and extensive shallows at the other. Heavy weed growth can make fishing difficult. Contains redfin, goldfish, brown trout and rainbow trout. Water level fluctuates widely. Beaufort Lake filled rapidly after the abundant rain in 2010. As a result the lake was stocked with 2,000 rainbow trout fry in November 2010. 650 ha. 43,000 ML. Boat ramp. A large shallow lake, often with discoloured water, surrounded by farmland, rock bottom. A popular fishing place with boating permitted in some areas. Contains predominantly redfin to 875 g, (av. 500 g), short-finned eel to 1.8 kg, tench, European carp, brown trout, and rainbow trout to 1.7 kg. There were some large golden perch from an earlier (1990) stocking, but anglers seldom take them. Lake Bolac filled rapidly after the abundant rain in 2010. As a result the lake was stocked with 5,000 rainbow trout in November 2010. 430 ha. 2,400 ML. Ramsar listed. A shallow lake surrounded by grazing land. Carries a land-locked population of common galaxias and is not recommended for angling. A small creek flowing into Lake Burrumbeet. A popular short-finned eel water also carrying redfin, tench and roach. Spawning and nursery area for redfin. 2,100 h. 38,400 ML. Camping ground, kiosk and boat launching ramps. A shallow lake surrounded by farmland. Sand and mud bottom with rocky outcrops along the shore. Water level can fluctuate widely and it is invariably discoloured. Nutrient levels are high and algal blooms can occur. When conditions are favourable, this is probably the most productive redfin water in Victoria, with fish to 2.5 kg and is very popular with anglers. Also contains short-finned eel to 1 kg, roach to 350 g, tench to 1.35 kg, goldfish, flathead gudgeon, Australian smelt and European carp. The lake is occasionally stocked with rainbow trout and at those times, it provides a very good trout fishery. Lake Burrumbeet filled rapidly after the abundant rain in 2010. As a result the lake was stocked with 5,000 rainbow trout fry in November 2010. 24 ha. 394 ML. Boat ramp. A shallow lake surrounded by farmland, mud bottom. Water is stained by tannin. Recreational Fishing Licence revenue has been used to erect stiles over fences and remove blackberries to improve access. Carries brown trout to 1.5 kg, occasionally up to 4.4 kg, redfin to 1 kg, flathead gudgeon and short-finned eel. A very popular water with local anglers. Stocked annually with brown trout and rainbow trout if water levels are satisfactory. A shallow lake surrounded by farmland. Access requires permission to cross private land. Was stocked unsuccessfully in the 1970s. Contains goldfish, short-finned eel, flathead gudgeon and possibly redfin. Not recommended as an angling water. A small, shallow, weed-choked dam surrounded by scrub. Fished extensively by visitors to a nearby holiday camp. Carries short-finned eel, redfin to 1 kg, tench and goldfish. Not stocked since 1979. 100 ha. 3,075 ML. Picnic area, toilets, playground, boat ramp. A shallow, sometimes turbid lake with a mud bottom surrounded by farmland. Access by road to the southern shore. There is a long concrete jetty with a wooden landing ideal for fishing. Water level fluctuates widely and in August 2002 became too shallow to support fish. This water has suffered the effects of drought for the past 7-8 years. When water levels are adequate, the lake is stocked with brown trout and rainbow trout and provides a fishery, carrying brown trout to 4.0 kg, rainbow trout to 1.4 kg, redfin to 1.5 kg. Good bank fishing and fly-fishing. Deep Lake filled rapidly after the abundant rain in 2010. As a result the lake was stocked with 2,000 rainbow trout in November 2010. Flows through flat farmland to Lake Bolac, gravel and mud bottom. The channel is up to 12 m wide with small irregular pools less than 100 cm deep, separated by narrow riffles 1-2 m wide. Vegetation and islands encroach into the channel. Marginally saline (>800 EC). Carries some rainbow trout, brown trout, redfin and short-finned eel. Best fishing for trout is around Streatham. Not a popular angling stream. 61 ha. 1,845 ML. Drains into the Hopkins River. Surrounded by farmland. Access is through a public easement, but the track can be difficult when wet and it is occasionally underwater when the lake is full. Water level varies widely. Carries brown trout to 2.3 kg, rainbow trout to 1.7 kg, with occasional fish to 2.5 kg, redfin to 1 kg, tench to 1.8 kg and short-finned eel. Also contains common galaxias, Australian smelt, congoli, flathead gudgeon, southern pygmy perch and eastern gambusia. A popular water with local fly-fishers, due to the quality of fish available and the lack of trees around the margins making casting easier. The lake is stocked annually with rainbow trout and brown trout. 235 ha. Camping, toilets, boat ramp. A shallow lake located 3 km east of Ararat and immediately north of the Western Highway. It was constructed in 1985 as a recreational area and has a mud and sand bottom. Stocked with trout by the Department when conditions are suitable. In the past, it was stocked lightly with brown trout to provide 'trophy fish'. Trout at that time averaged 1.7 kg and some were in excess of 4.2 kg. Redfin to 1.6 kg (av. 960 g) and European carp were also present. The European carp were illegally introduced in the late 1990's. The local Council has also stocked golden perch. Stocked with brown trout and rainbow trout when conditions are favourable. Greenhill Lake filled rapidly after the abundant rain in 2010. As a result the lake was stocked with 1,000 brown trout and 3,000 rainbow trout in November 2010. The catchment has been highly modified by land clearing and agriculture and water level and flow vary greatly. The water is often very turbid and is becoming more saline downstream of Willaura (>1,000 EC). Access is limited. A very small river flowing through farmland. Carries only short-finned eel, redfin and an occasional trout and is seldom fished. Flows for about 35 km through hills then in flat plains. At Willaura during summer, it is a series of shallow pools (12 m wide) in a 40 m wide channel connected by narrow shallow riffles, mud substrate. Riparian vegetation is mainly grass and instream habitat is poor. Downstream it flows through farmland, rock gravel and mud bottom. Contains predominantly redfin to 800 g, abundant short-finned eel, tench, Australian smelt, goldfish, eastern gambusia and flathead gudgeon. Reported to provide good redfin fishing at times. Flows for 50 km, at first through hills then flat farmland, mud and pebble bottom. Contains redfin, short-finned eel, tench, goldfish, flathead gudgeon, common galaxias, Australian smelt, southern pygmy perch and some brown trout around Hexham. Flows for 70 km through farmland with sparse riparian vegetation of grass and scattered red gums, mud and rubble bottom. Flows through a gorge in the lower reaches (downstream of Framlingham) with some riparian forest vegetation. Channel width is 2-10 m and the river is composed of riffles and pools over 150 cm deep. Access is restricted with only a few cross roads. Contains the same species as upstream. Stocked annually with brown trout yearlings, from above the falls upstream to Framlingham. This small section of freshwater immediately below the falls contains congoli, Australian grayling, short-finned eel, river blackfish, pouch lamprey, common galaxias, flathead gudgeon, Australian smelt, occasional brown trout and estuary perch. The estuary extends 11 km from Tooram Stones to the river mouth at Warrnambool. This is one of the best estuaries for recreational fishing west of Melbourne and is designated as a Premier River under the Go Fishing in Victoria initiative. It is renowned for providing exciting sportsfishing opportunities for anglers targeting bream and estuary perch with lures, soft plastics and flies. Saline wedges can form in this estuary; see note at the end of this Basin. Public boat ramps are located in Warrnambool at Lyndoch, at the end of Mahoneys Road, and at Jubilee Park. Access for bank anglers is available below and from the Hopkins River Road Bridge, at various locations within Warrnambool, at the end of Mahoneys road, at the end of Rowans Lane, around Deakin University, and at Jubilee Park. The east side of the river is largely private property and permission should be obtained before entering. Contains good numbers of estuary perch to 1.7 kg, bream to 1.6 kg, mulloway to 4 kg, yellow eye mullet, sea mullet, short-finned eels and 23 other estuarine species. Popular baits include sandworms, crab, minnow, whitebait and cockles. Fish can be caught throughout the year. Works to improve access and facilites have been undertaken and a detailed information package which provides information on angler access, fish species and angling techniques for the Hopkins River has been released. See Hopkins River - Fishing For a Premier Experience. Three new fish cleaning tables have been have been installed through the Enhanced Recreational Fishing Program. The tables are all located in close proximity to the three main boat ramps. A small lake in the town. A floating platform has recently been built to make fishing easier. Managed as a Family Fishing Lake and stocked with advanced yearling rainbow trout (See Introduction). 485 ha. 7,380 ML. Camping, recreation and boat launching facilities. A shallow lake surrounded by farmland, mud bottom. Subject to high summer water temperatures and fish can be affected by red worms (Eustrongyloides) in the flesh which are not harmful to humans. In mid 2008 the lake was dry but when levels are normal, it contains mostly redfin to 2.2 kg, short-finned eel, tench to 3 kg, brown trout and rainbow trout to 2 kg with bigger fish usually present. Subject to occasional fish deaths. Fishes well for redfin from November to January. Best trout baits are worms, local minnow or bait mixtures. Learmonth Lake filled rapidly after the abundant rain in 2010. As a result it is anticipated that the stocking of brown and rainbow trout will be resumed in the near future. 240 ha. 5,900 ML. Also called Shallow Lake. Surrounded by farmland. Connected to and fills Deep Lake by overflow. Access can be difficult as it is surrounded by private property. Carries redfin to 1.3 kg and short-finned eel. A rock-ramp fishway has been built at Bromfield Street Weir. Upstream of Bromfield St Weir (also called Wollaston Weir). A short (60 km) river flowing through hilly, cleared farmland. Riparian vegetation is predominantly grass except for some native forest in a deep gorge south of Woolsthorpe and willows and poplars downstream of Woodford. Its upper tributaries (upstream of Grassmere) are Spring and Drysdale Creeks. The lower reaches of Spring Creek are 1.5-4 m wide with extensive areas of water 40-80 cm deep providing good habitat. Drysdale Creek has pools more than 100 cm deep. Becomes the Merri River downstream of Grassmere and widens to 6-12 m. Pools to 150 cm deep are now common with riffles 4-12 cm. There is considerable deep water around Woodford, with some pools to 5 m, rock, rubble and gravel substrate. There is a very extensive reach of deep water upstream from the Wollaston Road, which can be reached by boat, launched down the bank at the bridge. Here the river is up to 26 m in width with pools to 5 m deep and abundant submerged aquatic vegetation. Accessible at a limited number of other points, but access is generally restricted by private property. Carries a few brown trout to 2 kg with some larger fish, congoli, short-finned eel, river blackfish, Yarra pygmy perch, Australian smelt, trout galaxias, common galaxias, flathead gudgeon, tench, eastern gambusia and some redfin. Stocked annually with brown trout yearlings. The weir is located at the end of Bromfield Street. This section consists of 11 km of tidal river flowing through grazing land, on the outskirts of Warrnambool, mud bottom and cleared banks. Maximum water depth is 5 m. Surveys have found low levels of dissolved oxygen (40% saturation) in the bottom 2 m layer of the salt wedge, near the Princes Highway Bridge, at times. Carries abundant brown trout to 4 kg, (av. 1.3 kg), redfin to 2 kg, tench, congoli and short-finned eel. Also carries good numbers, at times, of estuary perch, black bream, yellow eye mullet, sea mullet, Australian salmon and short-finned eel. This water produces some of the best quality, large brown trout in southwest Victoria. It is an excellent fly fishing water and is suitable for boating and all fishing methods. Boats can be launched upstream of the highway bridge at Dennington. 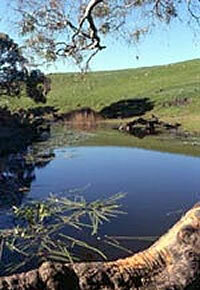 Flows in gentle, sloping farmland with scattered red gums along the banks. The underlying basalt rock results in riffles with rubble substrate in many areas and shallow pools. Flow during summer is low and some sections are choked with instream vegetation. The river is 10 m in width with runs 40-80 cm deep, and a boulder bottom. Riparian vegetation is red gum, grass and tussock. There is abundant submerged aquatic vegetation and the upper reaches provide good habitat for small-sized native fish. The river at Skipton is up to 10 m wide and flows in high banks through farmland. There are now extensive pools over 200 cm deep and sand substrate. The pools are separated by narrow riffles flowing through dense beds of canegrass which have encroached into the channel. Contains some brown trout, short-finned eel, mountain galaxias, southern pygmy perch, flathead gudgeon, goldfish and eastern gambusia. There may be an occasional European carp which has escaped from Lake Burrumbeet. Predominant angling fish in the Skipton area are brown trout and short-finned eel. Runs through flat farmland in a deep gully with steep banks; mud bottom with some rock. Width varies from 6-15 m. Characterized by sluggish water, small pools 100-250 cm deep, separated by narrow riffles choked with vegetation such as canegrass and cumbungi. Mostly cleared banks but some reaches have riparian vegetation of scattered red gum or willow. Local groups are working on habitat improvement including replacement of willow with native trees and re-vegetation of the banks. Main angling access is from road crossings. Carries redfin, short-finned eel, congoli, tench, occasional European carp, goldfish and some brown trout, mostly downstream from Darlington. The lower reaches, downstream of Panmure, also carry abundant river blackfish, common galaxias, southern pygmy perch and more brown trout than upstream with occasional fish to 2.5 kg. Some of the better fishing spots for brown trout are at Panmure Bridge, McKinnons Bridge and Castle Carey Bridge. 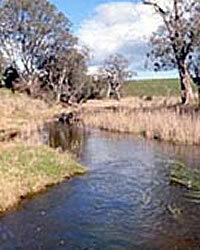 Stocked annually by The Victorian Fisheries Authority with brown trout yearlings at a number of sites. The whole length of Mount Emu Creek has salinities exceeding 1,000 EC and levels of dissolved oxygen often less than 80% saturation. Located in a volcanic crater and surrounded by grazing land. Boating prohibited and bank fishing is difficult due to dense vegetation. Probably carries some redfin. A small deep lake surrounded by scrub. Urban water supply, closed to all fishing - no access. Flows through farmland, mud and rock bottom. It has abundant aquatic weed and numerous deep pools. Carries redfin av. 220 g, (max. 1.3 kg), river blackfish to 450 g and short-finned eel to 2 kg. 2.5 ha. Also called Norville Dam. Surrounded by bush, gravel and mud bottom. Carries some redfin. Small man-made lake in the township. Carries some redfin. A fishing platform has been installed funded by the Recreational Fishing Licence revenue. Managed as a Family Fishing Lake and stocked with advanced yearling rainbow (See Introduction).